At a recent rugby tournament in Austin, TX, I had my first encounter with mobile credit card processing. You’d think that with all the work I do here at PaySimple with small businesses and cloud-based transactions that I might have seen this sooner or, at the very least, been eager to try it. In reality, I was a little apprehensive, but my only alternative was the possibility of an ATM a mile away, down a down a dirt road that (I’m sure) inspired more than one slasher film. So I decided to give it a go. Five dollars, two hot dogs and a Gatorade later, I can officially consider myself a convert — give me mobile payments or give me death. It’s fast! Once I got over the “I’m putting my credit card information on some stranger’s phone” shock of it, I realized how quickly and easily the transaction went. Mobile payments give more options. No need to find an ATM or beg teammates to spot me with cash. With the option to pay with my card, I could stay and watch the game and settle a little grudge match with my stomach. It’s professional. Receipts were delivered to me by text and email, verifying immediately that I was actually charged five bucks. Pay it and forget it. 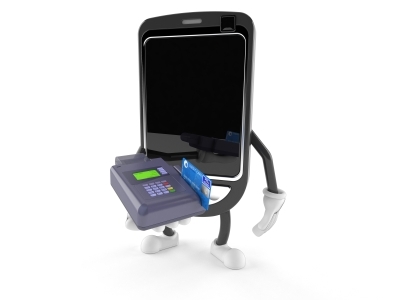 With mobile payments it?s one-and-done. I don?t have to repay a friends? cash-advance, which is pretty much the best part of my whole experience with mobile payments. Your customers, too, will appreciate a completed transaction instead of an unpaid invoice. So the next time you wonder if mobile payments are right for your business, take a minute and think if mobile payments are right for your customers. I’m sure that once you put yourself in your customer’s shoes, you’ll see the benefit of offering mobile payments are certainly worth it!